Before leaving for work this morning I used the food processor to knead up a batch of pasta dough. The dough went into the fridge to rest for the day and about 4:00 PM I called Moe and had him take it out so that it could come to room temperature and be ready to roll out when I got home from work. He also took a container of spotted prawns out of the freezer at the same time. A pan of cherry tomatoes (fresh picked from our garden) drizzled with olive oil and seasoned with minced garlic, basil and salt and pepper went into the oven immediately after I walked in the door. 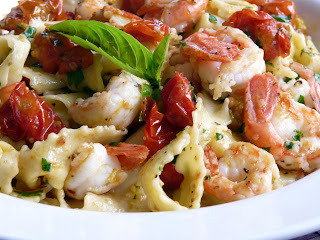 While the tomatoes roasted I rolled out the dough for the pasta and cut it into wide ribbons, put a pot of water on to boil and cleaned the prawns. 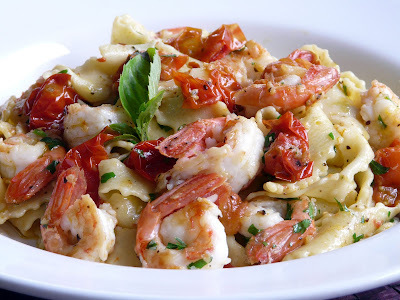 Dinner was pasta tossed with garlic simmered in olive oil with hot red pepper flakes, roasted cherry tomatoes, pan fried prawns , chopped parsley and fresh basil. This is my basic Pasta recipe. Todays batch was made in the food processor using two cups of flour, 2 1/2 eggs, one tablespoon of water and 1 tablespoon of olive oil and a little salt. I watched a friends Italian Momma make her pasta one day. (She did it all by hand) I make it following her directions but I use the Food Processor to mix and knead. 1 egg for each cup of flour( plus an extra egg for every 3 cups of flour, ie. 3 cups flour = 4 eggs, 6 cups flour = 8 eggs. 1 tablespoon of olive oil, per three cups of flour. Put the flour on a large board and make a well in the centre. Crack the eggs into the well and sprinkle with salt and oil . Use your fingertips to mix up the eggs and then start to incorporate the flour into the eggs. Eventually it will all come together. (add 1 to 2 tablespoons of water if necessary) Knead dough until smooth and elastical. Let sit covered for 15 or 20 minutes. Divide dough into smaller portions and run through a pasta rolling machine or roll out by hand. Let dry slightly and then cut into desire widths. Leave out to dry or use fresh. When dried she always stored it in a wax paper lined box, in a cool place. You can also mix and knead this in the cuisinart, which is what I do when I make it. much at a time, I just lay it all over my table and counter. Ann...I have been thinking of homemade pasta for the past week. You may have just pushed me over the edge! Yours looks wonderful! I haven't made homemade pasta in ages. I used to watch my (Asian) mother make them, grins. I just found your blog and have enjoyed it. One of the best comfort foods we have is my wife's homemade chicken an noodle soup. The homemade noodles make it great, particularly on a cold winter night. She just cuts the dough and drops them into the stew pot after the chicken is done.